Uwell CALIBURN 4pk Replacement PodsEach refillable pod for the Caliburn Pod Kit from Uwell has a 2mL..
Uwell CALIBURN Pod KitUwell presents their first ever pod system, the Caliburn, a low profile refill..
Uwell Crown IV TankC H E C K M A T E .Uwell Crown IV Tank is the upgraded version of the Crown ..
Uwell WHIRL 0.6 Ohm NiChrome 4pk CoilsWHIRL Replacement coils by Uwell are developed for both t..
Uwell WHIRL 22 KitThe WHIRL 22 pen-style kit, the larger edition of the WHIRL 20 Kit, is the next la..
Uwell WHIRL 20 KitThe WHIRL 20 pen-style kit is the latest device from Uwell, optimized for performa..
Uwell Nunchaku Starter KitProduct FeaturesTank Capacity: 5 mlMaterial: stainless steel & quartz ..
Uwell Fancier RTA & RDAFancier Description:1. Tank Capacity: 4 ml2. 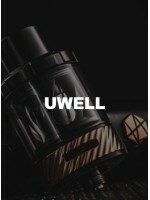 Size: diameter 24 mm × heigh..
Uwell Nunchaku TankProduct Features:Tank Capacity: 5 mlMaterial: stainless steel & quartz glass ..
Uwell Nunchaku 4pk CoilsThe 0.25 Nunchaku Coil uses a claptionized A1 coil rated for 40-50 watts.The..
Uwell Valyrian Tank Replacement Glass 5mLSold individually..
Uwell Valyrian Tank Replacement Glass 8mL..
Uwell Valyrian 2pk 0.15 Ohm CoilsReplacement Coil / Atomizer Head for Uwell Valyrian Sub-Ohm Tank&nb..
Uwell Valyrian Sub-Ohm TankUwell is very pleased to introduce our latest and greatest product, the V.. The Crown 3 coil system has been optimized for the perfect balance of vapor and flavor producti..
1. Top filling, easier and cleaner for customers to refill2. Plug-pull coil, easy to replace3. Separ..
0.25Ω Larger Clouds0.5Ω Balanced Clouds and Flavor.. Product Features:Delrin Insulated Drip TipAnti-leaking Top FillingTop Filling and Bottom FillTank Lo..
UWELL CROWN coils come in a variety of options.Dual Coils:.25 ohm.5 ohmNi200 Temperature Control Coi..
UWELL CROWN is the brand new generation of tank systems made of stainless steel and Quartz glass. It..